Irony has always flowed as sluggishly as cash through the corridors of Abbotstown. Which is probably why the dilatory FAI, who failed to be aroused from their slumber in order to officially notify the relevant people about the urgent injection of €100,000 yo-yos for bread and milk or whatever, would not have grasped the subtle absence of one of their trumpeted award-winners last Sunday evening. Ironies abounded, of course; the gift bequeathed to Emma Byrne, who in the same month as the FAI stuck their hands in their pockets and discovered only buttons, had joined her team-mates in broadcasting to the nation how they were forced to change clothes in airport toilets. At least Byrne was there. (We shall speed past Declan Rice, shall we?) The real curiosity was another non-appearance of an invited guest - Kakha Kaladze - which in itself shone a light on another absentee - Giovanni Trapattoni, whose 80th birthday fell last Sunday - albeit not that he had been invited in the first place. Doffing the cap to Kaladze seemed quite odd to us until one placed it in the context of tomorrow's visit of Georgia to the Irish capital, which reminded us that the reverse fixtures haven't always taken place in the Georgian capital. The countries' spiky history on the pitch has been as tasty off it, too. Back in 2009, Russia and Georgia had engaged in a brief war and there were no surprises as to the winner; when Ireland sought to engage with FIFA to move Trapattoni's first World Cup qualifier to another country, there was little doubt Ireland would win this diplomatic, rather than bellicose, battle. Kaladze, now mayor of Tbilisi, was not amused. "I and many of my team-mates continue to ask ourselves why this decision was taken," he told us then of the FAI's cavalier and selfish disregard of its own country's historic convergence of political conflict and sport, "There is no civil war in Georgia. We are not dangerous. What would happen if we played in the Tbilisi stadium? Nothing. It would only be a festival for thousands of people that are suffering." Tbilisi was deemed with less foreboding than Temple Bar after last orders on a Saturday night, but nevertheless, the game was switched to Mainz in Germany, where 4,500 punters, mostly Irish, watched the Italian's side triumph with more ease than the 2-1 scoreline suggested. Cyprus and Bulgaria would both, without incident, aside from conveniently failing to win, visit Tbilisi just a month later. Georgians, a normally pliant race despite their turbulent existence, have been simmering angrily ever since and, while not yet acquiring vengeance on the football field, are getting closer to doing so. Tomorrow marks the ninth meeting between the sides and, aside from a meaningless 4-0 friendly home win in 2013 - abetted by a harsh red card for goalie Giorgi Loria in the first quarter when the sides were scoreless - games between the sides have been close. Ireland may never have lost, but a draw last time out reflects the closing of a gap that is always vast on paper, but minimal on grass. If one skips over Saturday, this challenge marks the fourth occasion since 2003 when an Irish manager's first competitive qualifier presents the gritty yet guileful Georgians as opponents. The games are usually played on a knife-edge; once literally so when Brian Kerr opened his World Cup campaign in 2003, it having been rudely interrupted by Mick McCarthy's resignation. "We never felt in danger, but the players did," Kerr wrote in these pages two years ago. "There had been a lot of throat-slitting gestures before the game. Then all hell broke loose. "Kevin Kilbane got a belt of a knife, a bottle hit Shay Given's bar, Gary Breen got hit by a marble. It was a zany night in Georgia, alright." Gary Doherty thieved a late winner; a local thieved this writer's phone and other sundries; cue a one-sided 2,000-word chat with those long-lost ladies of newspaper stenography, the dutifully patient copytakers. "Is that Khizaneishvili with a 'k' or a 'c'?" Ireland would win the home tie, nervously enough, 2-0. Six years later, still reeling from their diplomatic set-back, Trapattoni's side found themselves behind after just 47 seconds; fate, as it would again, intervened to save Irish blushes. Kaladze had marshalled an inspired defence against an insipid attack until Finnish ref Jouni Hyytia penalised Ucha Lobjanidze for a handball that, seemingly, only he had witnessed. Keane slotted the penalty before his late winner, scrambling an attempted diving header home off his shoulder. Martin O'Neill maintained Ireland's unbeaten record, but his side arguably came closer than any to losing it. His one-time golden boy, Aiden McGeady, produced a rare double, and a superb winner, in an even rarer stand-out performance to rescue O'Neill's competitive bow. The double was completed at home en route to Euro 2016, but that summer's glow had long faded when the pair were matched once more. Murtaz Daushvili, donning a scrum cap, dominated O'Neill's already listing side before Séamus Coleman's unlikely winner, a scrambled effort involving three deflections, which more resembled a rugby try than a soccer goal. 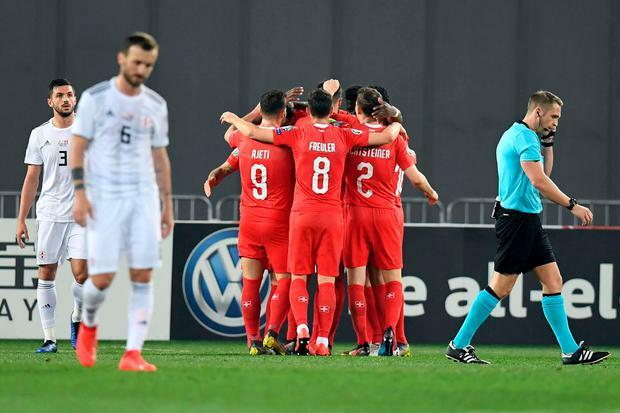 The return visit to Tbilisi was grim; Shane Duffy's emergence as Ireland's leading goal threat failing to obscure a forgettable display in an underwhelming draw, which reflected Ireland's decline and Georgia's superior technical ability. It marked the beginning of the end for O'Neill; McCarthy's men will need to show that they can rise to what history proves is always a stern challenge for technically-deficient Irish teams. Having lost 2-0 to Switzerland in their opener at home on Saturday, Georgia don't lack incentive.